Jeremy Williams, shares his 8 week journey as he coaches himself back into shape. He shares the day to day challenges, and the strategies he uses to overcome them. Read his private posts and watch his personal videos along this 8 week program as each day and week builds upon the success of the last. A major component relating to the probability of your success, is your level of desire. How much are you willing to do, go through, or put up with, before you quit. One’s level of desire is a major factor. In my estimation from personal experiences as a coach and event promoter, I would say that half of the people that intend to compete drop out long before the contest. The thing that I have noticed when coaching is the way in which the successful people describe their goal during my assessment evaluation. I can almost predict who will quit and who will make it to the stage months before we get there. These “Champions” have a very clear picture of their goals and strong emotional connections to them. You may not be intending to compete in a contest. You still can learn how to motivate yourself to achieve your fitness goals by developing a strong inner desire like successfull bodybuilders and fitness competitors. What is your goal? Take a moment to think about your fitness goals. Write them down and review them daily. What do you want to look like? How do you want to feel? What do you want to be able to do? What are the timelines of your goals ? What are your daily, weekly, monthly, yearly, 5 yr & lifetime fitness goals? How do you intend to live the rest of your life? Brainstorm your goals and write them down. Thinking about how achieving your fitness goals will positively impact other areas, experiences and people in your life will help you create the leverage you will need to create the desire, dedication and determination you will need. Additionally thinking about the negative impact on your life if you do not improve your fitness level. How will this negatively affect the life of yourself and those around you? The pursuit and achievement of your goals will have a positive effect on a many areas of your life. Think about and write down how the rest of your life will be positively impacted by the pursuit and achievement of your fitness goals. A few brainstorming ideas below to get you thinking about various areas of your life. It’s your job to think about and visualize how your fitness level will impact your life…..
Health, longevity, life span, energy, strength, endurance, flexibility, vitality, family, friends, self esteem, confidence, feeling of significance, pride, work life, education, school, mental health, spiritual health, finances, energy, self esteem, relationships, romantic relationship, ability to help others, enjoy life, enhanced life experiences, ability to act, relationship with nature, physical activities, outdoor activities, play, live with passion, spiritual, physical, social, family, financial, vocational, career, business, mental, learning, personal development. Associating a variety of deep feelings, mental images and stories, to the pursuit of your fitness goals will create great power to draw upon for motivation in your moments of weakness. When you don’t feel like working out, doing cardio or eating the food you should eat. Think about these associations you have made to create the you the motivation to do the right thing. Brainstorm your goals and write them down, and create strong mental images. Dream big, dream often. Here we are. Day one. No more messing around. Now that you have decided to take your fitness to the next level there are a few things to consider and take care of. I have had my daughters take my pics and help with my measurements. I will share these at a later date after I have made some progress but I can honestly say I think I am in the worst shape of my life. Maybe you’re in the same place. I am excited for this because if there’s one thing I know it’s how to change a physique. You also need to figure out a system for prepping your food. To be successful you need to set yourself up for success by having your meals ready. The people that succeed find a system that works for them asap. In the past, I have used and seen many systems for preparing and packaging food. Everyone has some sort of family, work or life issues that bring up challenges. Whatever you need to do to be sure you have meals ready as well as some sort of back up. Here are a few variables that people have used to adapt to their lifestyles. Food prepped and stored in large Tupperware in the fridge and each day the meals are made from the large batch and placed into daily meals. Meals prepped placed in the freezer and then one day out placed in the fridge to defrost one day before. This seems to work well for the people that prep 5 or more days worth of food. I am setting out to prep for about 3 days of food at once. My daughters and I are doing it together so we are having fun with the planning and preparing of meals. You need to set out to train your entire body once a week with weights. We will add details to this but for now. Figure out how many days a week you can commit to working out and then break the body up so you train the entire body once a week. I am going to be training in the garage with my daughters and we are doing the following schedule. You also need to do cardio at least 3 days a week. Strive to do it every day if possible. Try alternating one-day low heart rate the next day high heart rate. 80%(220 minus age times .80) of max on high days. 60% of max ( 220 minus age times .60) on low days. Start with 20 min a day. We intend to do cardio every day. So that I can successfully, inspire, motivate, educate and hold you accounted I have a variety of thing I want you to connect with. So you get messages, emails, social media reminders. Your Goal is to set out to start. Start Now. When you mess up, don’t quit just realize where you went wrong and move on. The hardest part is starting and staying on track in the beginning. I am here for you. I will be sending more details every day. Feel free to ask me questions, and share your problems and successes. This will help me help you and others more effectively. Go the store get the food you need. Prep the food. Package your meals and set yourself up for success. Start working out and doing cardio. Just make each day better than the last. Are you FED-UP being out of shape? I know I was! After years of competing in bodybuilding as well as coaching others in the sport I got burned out and shifted my attention on other areas of my life. My own health & fitness has taken a back seat for far too long. Im sure you can relate. Maybe you were in better shape in your past or have always wanted to improve your fitness level. I am through with being out of shape and it’s time to “GET BACK ON POINT”! I would like to help out as many people as I can along the way. It makes the journey more enjoyable, feels good to help others, and of course, creates a bit more leverage and accountability on this fitness journey. I will be utilizing principles learned from over 30 years of bodybuilding experiences as well as formal education from my paramedic…. ect health sciences knowledge. I challenge you to use these proven strategies to transform your fitness level with me. It is important to me this time around that I maintain balance and energy in all areas of life while undergoing this fitness transformation, which is something i’m sure you can appreciate, cant you? Let’s get in shape together but be sure to enjoy the process, & maintain a balanced life. I have set a series of goals, as should you. I intend to make a significant change over the next 8 weeks. So I have developed the “8 week Fitness Transformation Program”. As well as the book: Balancing, Health, Fitness & Lifestyle, to be used as a guide. I would like to invite you to “Get Back On Point” with me and the rest of the “NW FitClub” as we motivate each other. Let’s learn from the experiences of everyone in the group as I openly coach myself and others to fitness success through proven positive reinforcements. Consistency & Accountability is the key to success in this. So I have created multiple ways to hold all of us accountable to each other. I want to be sure you are getting the updates every day. Weather you log into the site or not. NW FitClub Members will also receive the daily coaching info through email reminder links posted to the NW FitClub FB group and page. This Program is for anyone wanting to get in better shape, enjoy the process, and maintain balance in life. Just because I used to be a competitive bodybuilder does not mean you have to be one too. I am doing this 8 week transformation with my two daughters and plan on having fun along the way. This is family friendly and co ed fitness programming. I will be fine tuning, & updating the book over the next 8 weeks, but the info in there right now is the info you need to get started and start making changes and progress with me. Summer is coming whether you are ready or not. This year I am going to be back in shape! ARE YOU?! Daily advice, Videos, images, tips, tricks, Post questions in the NW Fit Club V.I.P member group for Jeremy to answer. Private message Jeremy through the NW Fit Book personal message system. 8 week transformation program – “Getting Back On Point” Here…. Train each body part once a week to with intensity (to failure). Every meal needs a protein & carbohydrate source. Strive to eat a vegetable with each meal as well. Drink a Glass of water with every meal, and during exercise. In reviewing these guidelines many new questions may come up for you. You may think you need to have the answer to a few more questions per guideline to properly start out on the right foot. If this is the case, you are not giving yourself enough credit. You are smart enough to get started within these 8 parameters. There is so much information out there on nutrition and training that it seems to overwhelm people and they tend to overcomplicate everything. So many people over complicate it to the point that they never start. It is very likely that the answer to your question will come later in this program when necessary. I will provide you with information and goals in a systematic orderly fashion strategically designed to build upon the principles and skills that you previously will have learned and mastered. Strive to make each day and week better than the last. NW Fit Club – Webinar 7pm, Monday, April 17th on this page. Available to all NW Fit Book members. Must log in to view webinar on this page. I would like to make note of the impressive fact that few people know about the condition attained by the athletes below. They attained that dry, hard look without the use of prescription diuretics. They did not wait until the last moment in hopes for something miraculous to happen the last day, week or month. A long Term realistic assessment, self evaluation, a strategic plan and hard work is what attained the look of these Champions. Do you have what it takes? Adam Tabalno – Crossfit competitor, Olympic lifting competitor, Tri-Athlete, Kickboxer, Former Bodybuilder, and the list goes on and on with this guy. 1st in Masters 35yrs and older, and 3rd in the 5’8 Open division and 4th place Over All Men’s Physique Division. This was my biggest accomplishment ever… I can’t thank you enough Jeremy Williams for helping me achieve my goals/success! after much needed rest over the weekend… I want to send a huge Shout Out to my coach Jeremy Williams! 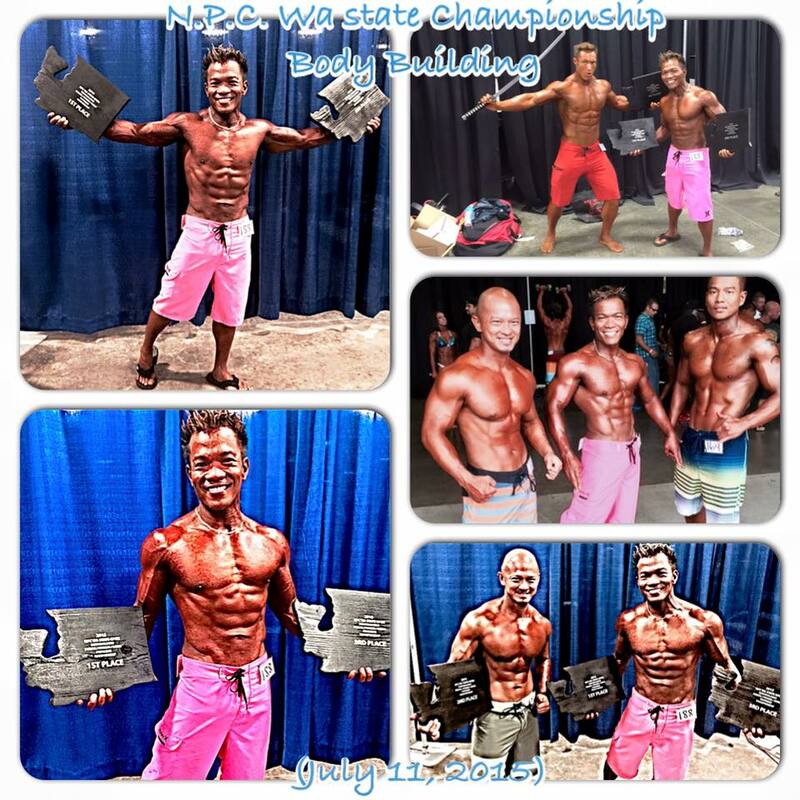 NPC WA State Championship Bodybuilding was The Biggest milestone of my life! I had a goal to achieve something I once thought was impossible. Through dedication, perseverance and consistency, I managed to achieve that once impossible goal of stepping on stage with the help and support of Jeremy Williams. He has not only been a Great coach but the Best mentor of my life. I’m forever grateful for his knowledge, guidance, assistance, and for keeping me on-point with my nutrition and workout plans. 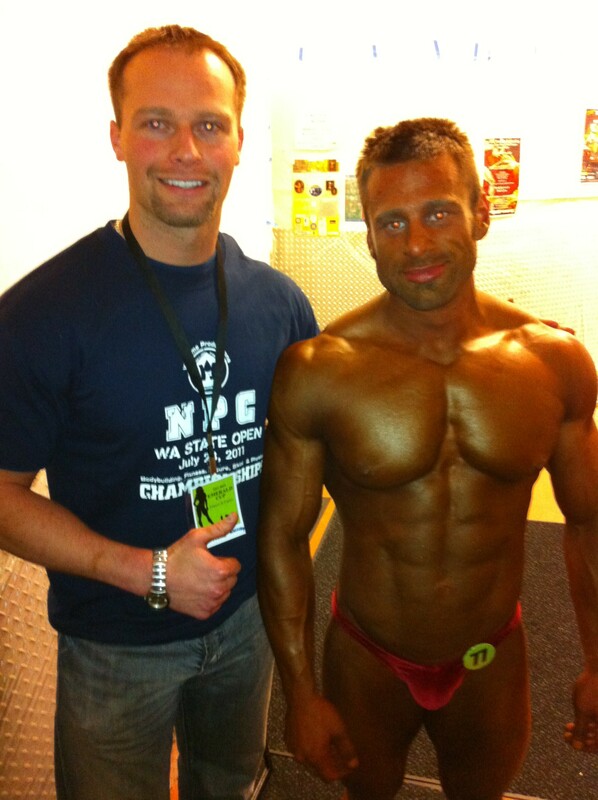 Jeremy Williams, your guidance and support prepared me to be my best, to be a winner on stage! I could not have done it without you. I also want to thank my very supportive mom Milagros Gatan for helping me prep my meals each week and for being patient with me when I had to restrict my carbs. Finally, I thank all my friends and family for supporting me on this journey. I am grateful to you all!